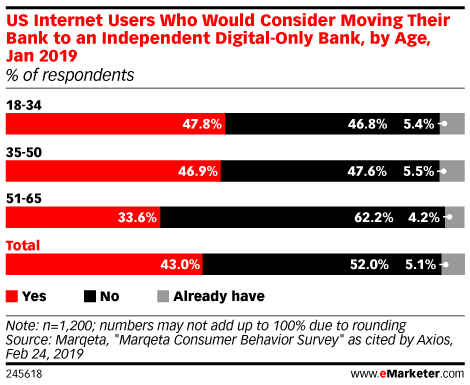 Fewer than half of millennial respondents ages 18 to 34 said they’d consider moving their accounts to a digital-only institution, according to January 2019 data from Marqeta. According to Marqeta, 27% of US millennials feel that digital apps are the most important service their bank provides. But, survey data released in Q1 2018 from Javelin Strategy & Research and Jumio found that 43% of millennials had abandoned mobile banking activities because the process took too long or was too complicated. What’s more, according to Mark Riddle, director of research and content delivery at BAI, half of all millennials would switch to another bank or credit union if it offered a digital app that was superior to the one they were using. Read the rest at eMarketer.